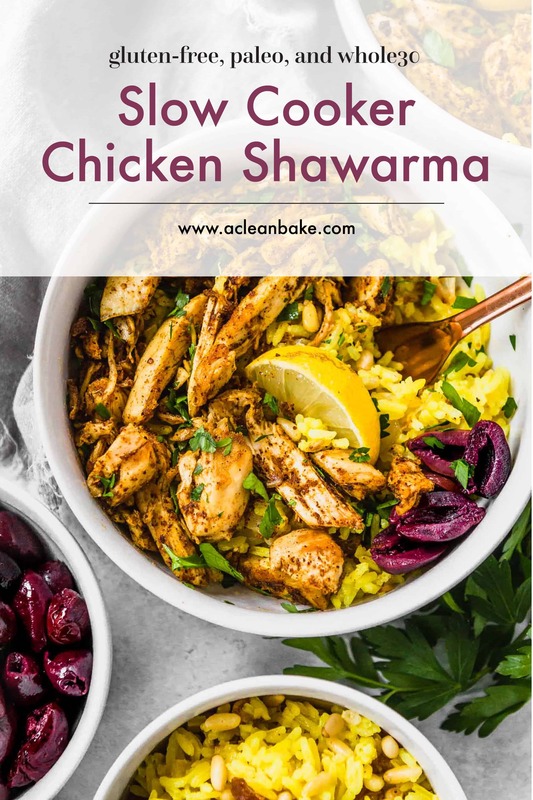 Slow cooker chicken shawarma (aka shwarma) combines the ease of a slow cooker meal with the complex flavor of a slow-roasted middle eastern chicken feast! This is a quick version of the middle eastern favorite: the slow cooker does a lot of the work and it can be prepped ahead of time. Various serving options make this sensational paleo and gluten free dinner recipe adaptable for low carb and Whole30 compliance, too! I’m afraid I’m going to blow your minds with this one. Or maybe I’m not; maybe I just don’t get out much anymore (I mean, have you seen the single digit highs we’ve been having in Chicago??? I’m way too wussy for this winter). 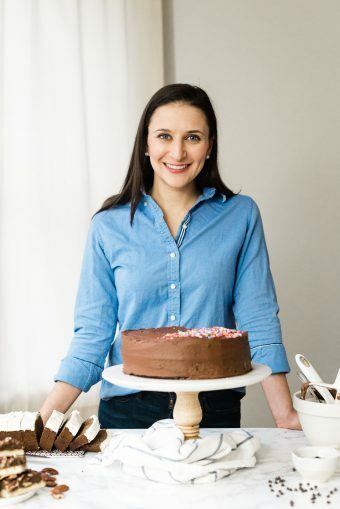 …low carb, gluten free, and whole30 compliant. …also known as shwarma; by either name, it’s just as good. It is so cliche this time of year, but I know I am not alone in relying heavily on my slow cooker this time of year. The ease with which that thing offers up comfort food; it’s practically magic. I’ve been rotating through a ton of slow cooker recipes for dinners lately, but this one is, by far, the one that has been getting the most mileage. Like most slow cooker recipes, it’s one that can yield as much or as little food as you need. That said, I suggest doubling the recipe if you’re meal prepping, as an easy way to get a couple meals out of the least total time prepping. …and I’ve been known to. I think we had it three times last week, and I still want more. It’s no secret that I am moderately-to-let’s-face-it-extremely obsessed with middle eastern food, and I love making my own at home. 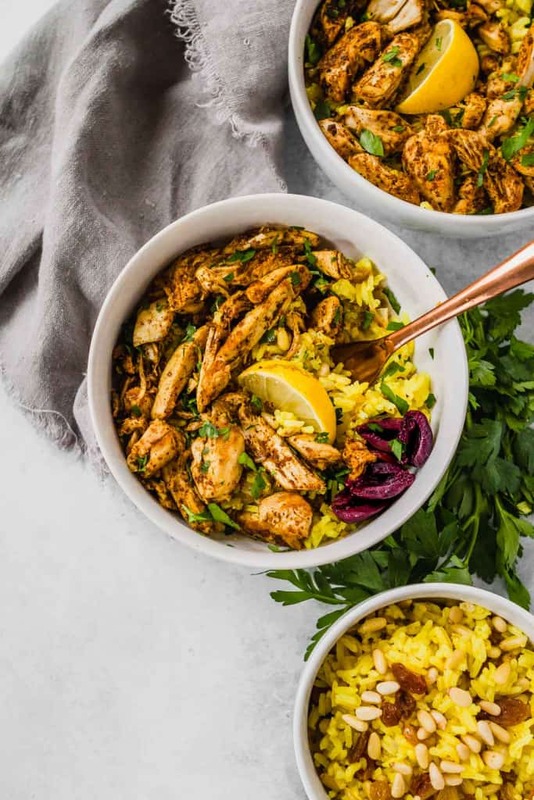 This chicken shawarma recipe is one that I kind of made up on a whim about a year ago and have been tweaking and perfecting ever since. I admit, this is a total cheater’s shawarma (but until I achieve my dream of having my very own supply of meat on a spit in my own home, this will have to do! ), and there are two parts to the cheat. You’ll start by cooking a few boneless, skinless chicken breasts in the slow cooker. You can use a mix of breasts and boneless, skinless chicken thighs, if you prefer. Just don’t use all chicken thighs, which get too fatty once you fry them into shawarma. Oh, and if you prefer a longer cooking time on low heat (instead of quicker cook on high heat, as the recipe calls for), just use this easy slow cooker shredded chicken method, but don’t shred the chicken once it’s done. Once your chicken is cooked, you’ll be ready to move on to part two, in which the shawarma-ing happens. It’s at this point that you’ll look at your cooked chicken and then back at me as though to ask “are you sure, Nora? This looks… unappetizing.” Yes, I’m sure. Remove the cooked chicken from the slow cooker (discard the leftover liquid) and slice it up. Then you’ll simply fry the sliced chicken with your spice mixture, which I give you the recipe for below. Before you ask, you can definitely make the chicken ahead of time. Don’t worry about it getting cold; it will heat up when you finish cooking it in the pan with olive oil and a to-die-for homemade spice mix. Make the chicken the day before (or even a few days before) you plan to serve it, store it in an airtight container in the fridge until you’re ready to eat, and then do the pan frying part right before your meal. You can also make the spice mixture in advance; store it in an airtight container at room temperature for up to a week. And, I’m sure you’re wondering why this recipe calls for double cooking? Well, two reasons, really. First, so that this can be a make ahead recipe, if you want it to be, as I said above. But also, because that is what mimics the texture of shawarma, without many hours on a rotating spit. Shawarma is made from marinated meat that is packed tightly together and slow cooked, so that the fat renders out of the cuts that have some to spare and moistens the entire cone. Yes, meat cone. The slow cooking near an open flame crisps the exposed edges so that you get some crunchy bits and some soft bits in every bite. Frying the cooked, sliced chicken with spices adds the fat back in (from the extra virgin olive oil; this is the one I use and love) and crisps the edges (from the frying process), and flavors the whole thing with a heavy dose of seasoning mix that allows you to skip the time consuming marinating process. As you can see in the picture, it’s not a particularly elegant food. Chicken shawarma is, in my book, the kind of food that never stands alone, and is best enjoyed in a bowl full of lots of textures and flavors – rice, olives, sumac onions (or marinated red onion), and a drizzle of fresh lemon juice on top – with a fresh, crisp salad (I’m biased, I know, but I think my Jerusalem salad goes really well with this!) on the side to balance out the silky rice and aromatically-spiced chicken. As for what to serve it over, rice is, as I said, my preference – and I’ll share the recipe for the turmeric rice you see in the bowl later this week or early next. 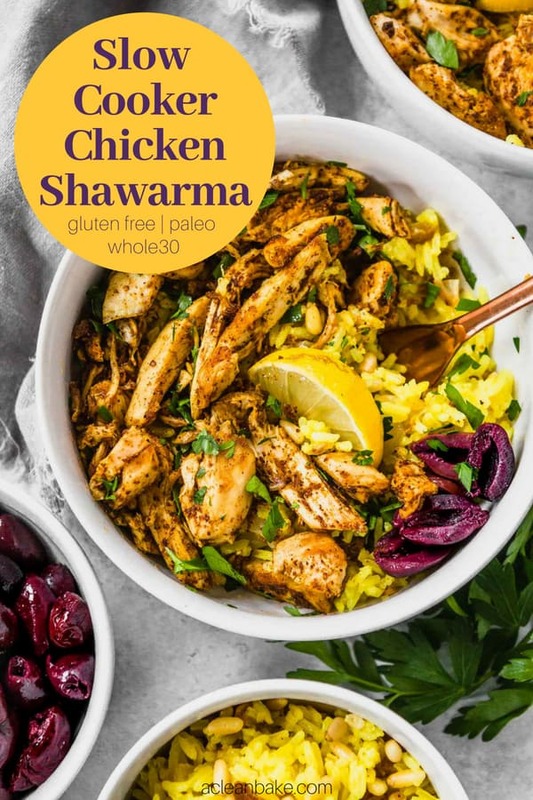 But you can certainly stuff a gluten free pita bread with this shawarma to make it into a sandwich, or keep it in the bowl, but use a base of cauliflower rice to make it low carb and Whole30 compliant. No matter how you eat it, I hope you enjoy it! 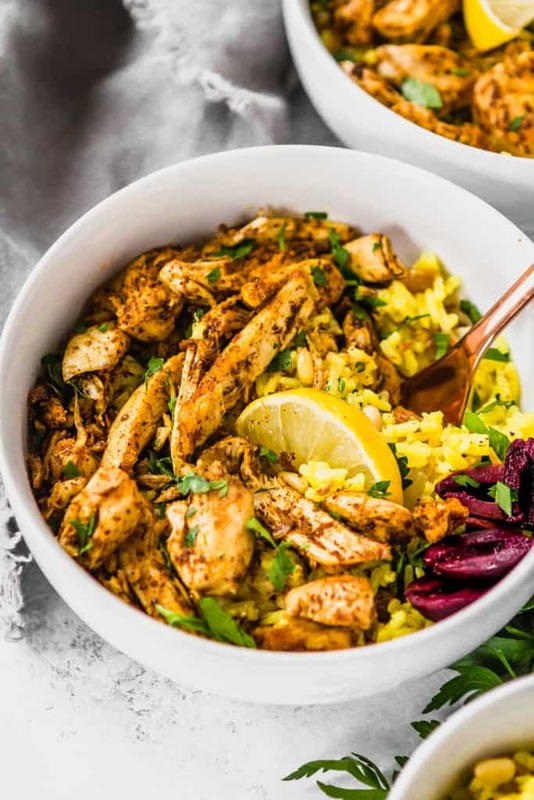 If you pair this shawarma with Jerusalem salad and turmeric rice, it makes a perfect meal! 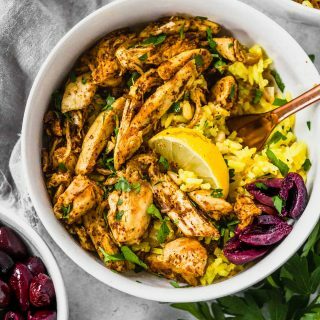 Slow cooker chicken shawarma combines the ease of a slow cooker meal with the complex flavor of a slow-roasted middle eastern chicken feast! 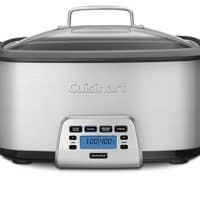 This is a quick version of the middle eastern favorite: the slow cooker does a lot of the work and it can be prepped ahead of time. Various serving options make this sensational paleo and gluten free dinner recipe adaptable for low carb and Whole30 compliance, too! Place chicken in the bowl of your slow cooker, and add water. Cook on high 2 hours until the chicken is cooked through (the juices run clear and the fat has rendered out of the chicken). When the chicken is cooked, slice each breast against the grain. In a large bowl, mix together all of the spice mix ingredients. Set aside. Over medium high heat, preheat 2 Tablespoons of olive oil in a heavy bottomed pan large enough to hold all of the chicken in a single layer without being too crowded. Add the chicken to the skillet and sprinkle the spice mixture evenly over the chicken. Allow the chicken to fry, without moving it, until crisp. Pour 1 Tablespoon more of oil over the chicken and flip the chicken, stirring gently to make sure that the chicken is well coated with the spice mix. If the chicken is starting to stick to the pan once flipped, add the remaining Tablespoon of oil and stir gently. Remove chicken from pan as soon as it is crisped to your liking. If serving with lemon tahini sauce, combine all sauce ingredients in a blender and blend until smooth. You can definitely make the chicken ahead of time. Don't worry about it getting cold; it will heat up when you finish cooking it in the pan with olive oil and a to-die-for homemade spice mix.Make the chicken the day before (or even a few days before) you plan to serve it, store it in an airtight container in the fridge until you're ready to eat, and then do the pan frying part right before your meal. You can also make the spice mixture in advance; store it in an airtight container at room temperature for up to a week. 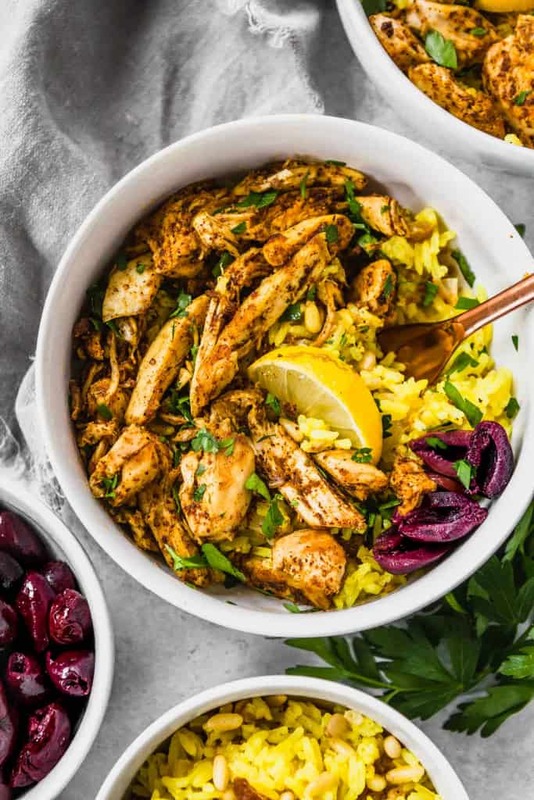 Chicken shawarma is, in my book, the kind of thing you don't each on your own, but instead serve in a bowl full of lots of textures and flavors - rice, olives, sumac onions (or marinated red onion), and a drizzle of fresh lemon juice on top - with a fresh, crisp salad (I'm biased, I know, but I think my Jerusalem salad goes really well with this!) on the side to balance out the silky rice and aromatically-spiced chicken. As for what to serve it over, rice is, as I said, my preference. 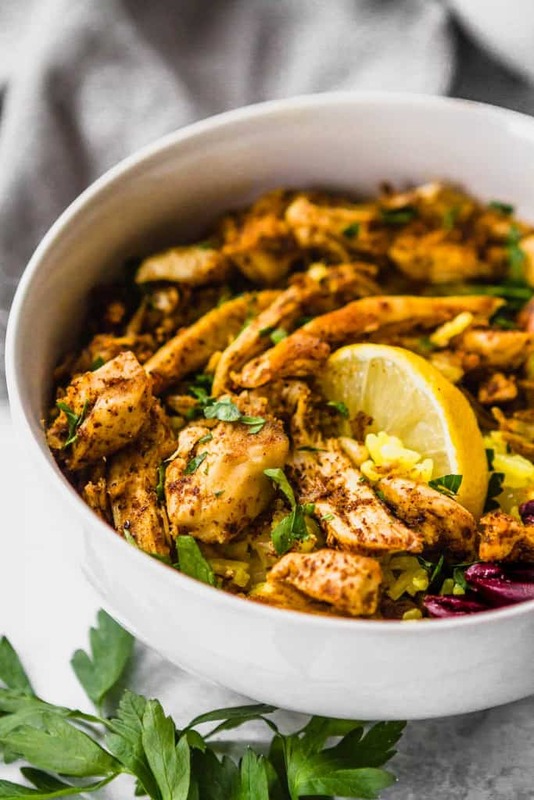 But you can certainly stuff a gluten free pita bread to make it into a sandwich, or keep it in the bowl, but use a base of cauliflower rice to make it low carb and Whole30 compliant. This is one of my favorite meals of all time! I make it at least once a week. Love that it’s a slow cooker recipe too! I have to admit that I’ve never had shawarma before. This recipe is very doable! Looks delicious! Oh I hope you get to try it! Can you start with frozen chicken or is it best to thaw first? I’m planning to make this for dinner tomorrow but wasn’t sure if there’d be a texture difference. So sorry for the slow reply time! I never recommend using frozen chicken in the slow cooker because it defrosts slowly and stays too long at a temperature where bacteria can develop. I always recommend using defrosted/fresh chicken in slow cooker recipes! Do you think it would still be tasty if I fried up the spices and then just added them to the slow cooker chicken and mixed? Serving this for a large group with rice and don’t want to fry it all by hand after. Thanks! You certainly can, but the chicken won’t be crispy! If you’re ok with that, then go ahead. It sounds like it would be much easier for a crowd! The calorie count does not include the tahini sauce. Service size is 1/6th of the total recipe. I’d recommend following the recipe as written. I am not sure why I wouldn’t just cook the chicken breasts for 25 minutes in the oven, and proceed with the recipe. A 2 hour crock window of time seems silly to me. There are two reasons for the crockpot method: first it ensures the chicken stays moist. Remember, you’re double-cooking the chicken (first cooking it through, then frying it with the spices). If you cook the chicken in the oven, then try to fry it until crispy, it’s going to take on the texture of a hockey puck. And second, doing it in the slow cooker means you can let it cook while you’re at work, running errands, or generally not paying attention. That’s a key aspect of any reliable recipe for me, and I know I’m not alone. If you prefer to use the oven, feel free to bake some chicken breasts according to your usual method, seasoned with the spice mixture from the recipe, then slice them against the grain before serving. That will work fine too.